Actually it depends on the type of your site, its contents, etc. You've to analyze which keywords bring most visitors for you. You can contact us by contact tab at the top. Why don't you share your site's link? It was more important than your Mail ID. Subscribe to our comment. Answers will be delivered to your mail inbox! Very good article and very well written. I Googled this topic and your article came on top! Now I will re-write the search description of all my articles. Thanks and Please visit my blog www.chitrannaa.blogspot.in and give your valuable suggestions. Thanks Ms Lalitha Prakash for your valuable feedback. I must visit your site at least to respect your request . . .
You're welcome. But this is not the right way to create link . .
Nice work. Simple and to the point. We like to hear your voice. We consider the comment as feedback! Stay with us . . .
Spamming is prohibited in Marks PC Solution. If you continue spamming, your comment will be removed! Very nice post and helping about SEO techniques, your posts rock. Very good blog....just searching about SEO and found your blog.Apart from keywords, content etc this is a basic thing one must know to gain more traffic on a website. Thnx for the comment. Keep visiting . . . I think so. Or they are almost similar. But there is a possibility of having technical difference. Because blogger has an option to enable search description and meta description. Only description is shown just below your Blog Title. 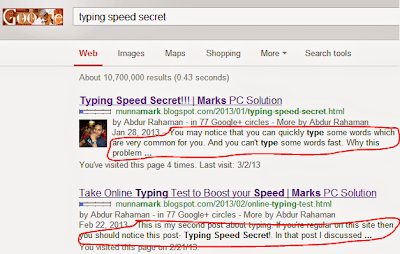 And meta description is shown in Google or Bing search results. Dude you won my heart so I clicked on a 1.2$ cpc adsense ad of dell laptop...enjoy !! !because you shared a very genuine thing which people rarely share!! But never click on Ads to increase my earnings. Google doesn't like it. Anyway, stay with Marks PC. Share your views with me. Help me to write contents which are interesting for you. You have very nice way of writing articles. I think my posts are not so good. Can you take a look at http://www.techcoderblog.blogspot.in/. Please Give me some feedback. URGENT!!! NEED HELP!!! btw thanks for such valuable info. Hello my friend i like your blog and i personally follow your blog post . Actually i want to create a blog and i have some confusion about some blogger features . Query 1. i am so confused in blogger under setting tab - Basic - there is description option and when we go to search preference under setting tab there is meta tags description option. i hope you understand my question. Now my question is that what should i write in both of these options? Should they be same or different from each other because both the options have different word character limit one has 150 character (Basic description) and other has 500 character (Meta tag description). Query 2. I have one more doubt is it necessory to write Title, Meta description and Keywords in HTML page also ? If yes then should it be same as in above setting options or different from them? 1. Description will be shown just below your Blog Title. It is just describes your site. Thus people will be informed what your site is about. 2. 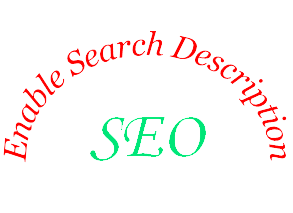 Description under search preference is how you wanna say about your site to search engines. This description will be shown in the search results. What to do: Both of the description can be same or different. It depends on your site or your mentality. If you wanna make them different you can. No problem. But I think both of them should be relevant with each other. Primarily when I am start my blog I dont know the value of blog name and blog description, that time i just conceive blog url with my title and give distinct name to my blog.after reading your post i realize the importance of post description.after reading your post I enable post description option in my blog and furthermore add description to my older post. Hey I have one foolish question about Permalink ,is this helful to boost the visibility of my blog post in search engine ? Something you know today correct, maybe wrong tomorrow. So never think yourself stupid. Ya permalink has some effects on search results. The more similar your post title and permalink, the greater the facility in search result. But if your site is strong enough, you can customize the permalink. No problem.